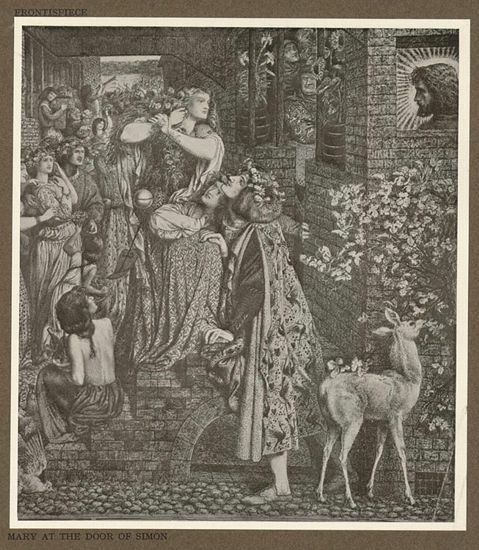 As a young, keen Pre-Raphaelite researcher, back in the last century, I turned to the library copies of Virginia Surtees’ Catalogue Raissones of Dante Gabriel Rossetti (2 volumes: one indispensable text volume and one eminently more fun picture volume). It was from them I learnt about his work, hours of endless pouring over them, photocopying pictures, making notes, and when I came to make the catalogue at the back of Stunner, I added Surtees' numbers. Of course, these days I go straight to the Rossetti Archive online not least because I can no longer borrow the Surtees catalogues from the library because they are worth hundreds of pounds per volume (our librarian helpfully suggested I asked for them for Christmas, to which I answered that I would be sure to ask my Sugar Daddy for them as she obviously took me for some rich man’s poppet), but the on-line archive also uses Surtees' numbers. 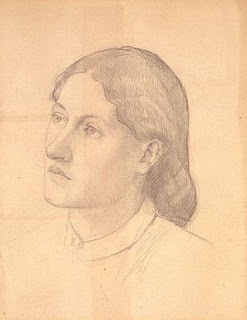 After all this rambling I have to admit that today’s post is not about M’Lady Surtees, but her great grandmother, the Pre-Raphaelite Stunner, Ruth Herbert. Now, I’m guessing you all know Miss Herbert’s name. She is quite a presence in the history of the Brotherhood. 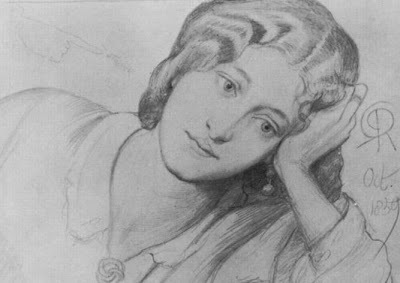 Rossetti was obsessed with her, Boyce fancied her (Boyce fancied everyone), Watts thought she was a bit swoony, but on the whole she remains on the outside of discussions of Stunnerdom. Her likeness was present in many a Rossetti sketch, and beside her head he wrote ‘STUNNER’. So why do accounts of the women in Pre-Raphaelite art remain so, well, ‘Ruth-less’? 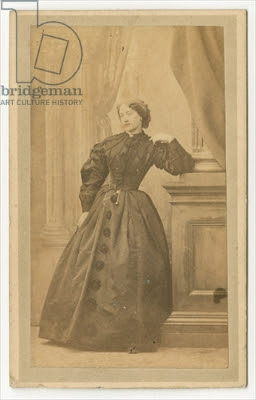 Louisa Ruth Herbert was born in Clifton, Bristol in the early 1830s. Daughter of a Brass Founder, she married Edward Crabb, a respectable share and stock dealer at a young age. In the 1851 census, she was living with her widowed mother in London, living on their own means. At some point Louisa had dispensed with her unlucky husband (despite being known as Mrs Edward Crabbe, with an extra 'e') and was treading the boards in London. She began in the rather more seedy theatres, like the Royal Strand, before moving through The Olympic and up to St James' Theatre. It took Rossetti a little time to secure her services as a model. He wrote to William Bell Scott in 1858 "I am in the stunning position this morning of expecting the actual visit at 1/2 past 11 of a model whom I have been longing to paint for years – Miss Herbert of the Olympic Theatre – who has the most varied and highest expression I ever saw in a woman's face, besides abundant beauty, golden hair, etc. Did you ever see her? O my eye! she has sat to me now and will sit to me for Mary Magdalene in the picture I am beginning. Such luck!" This is possibly the best known of the pictures of Ruth, tall, blonde, long of neck and striking of features. 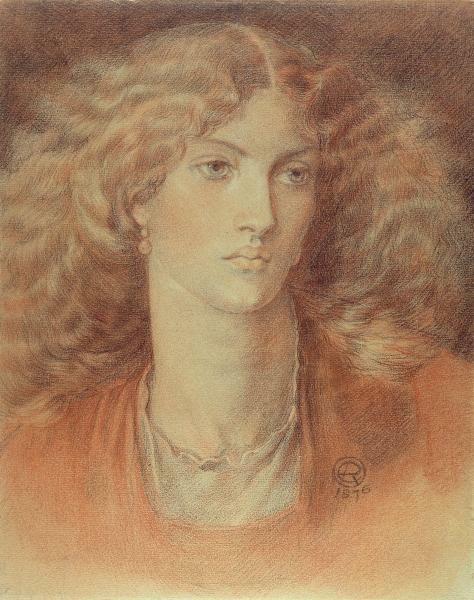 Rossetti became utterly bedazzled by her, which must have gone down well with poor Lizzie/Fanny/Annie/Jane, but her position in his life is less 'mistress' (in the mould of Fanny or Annie) but more 'goddess' (in a role that Jane would take up later), a sort of untouchable and awesome beauty, to be captured. I'm not saying he didn't try his luck, this is Rossetti after all, but he seems to have used her purely as a model of beauty. 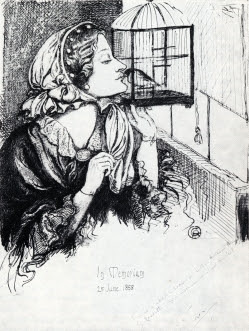 Miss Herbert leans in to blow kisses to a pet bullfinch, sketched after Rossetti had seen her again at Little Holland House. 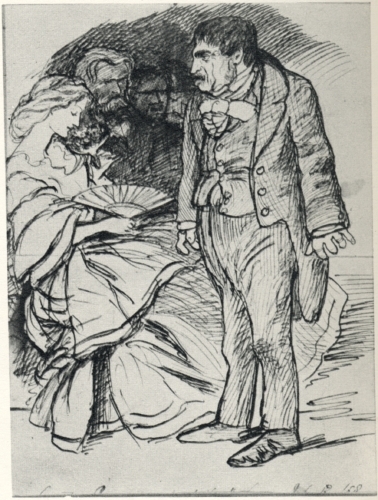 The image is quite cute and reminiscent of other pictures of women and their metaphoric bird (it's really them in a gilded cage etc etc) but there is a poem that is dated from 1858, during Lizzie's absence from her troublesome lover's life, about a woman and a bullfinch, which is ripe with sexual symbolism. Ruth seems to have been the flavour of the month, as Rossetti recorded in this sketch. The swan-necked actress is surrounded by admiring gentlemen. The men in question are not flatteringly drawn, and it is suggested that the figure in the background is William Morris. A 'benefit' was held for Ruth in July of 1858, and Rossetti promoted it, pressing his friends to attend, and it seems at this point the artist saw the actress as the pinnacle of stunner-dom. I think this image of her could easily be mistaken for Jane Morris, especially given the date, but the hair is too light. 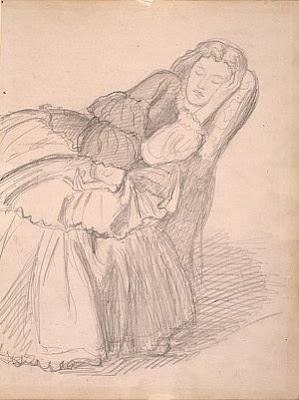 Mind you, comparing the sketches of Ruth as the Virgin Mary in the Llandaff Triptych and the subsequent replacement images of Jane, the two women bore much in common, as far as Rossetti's eye was concerned. As for her life, she married again to an Oxford graduate from Ireland, John Downes Rochfort and actually published a cookery book, 'The St James Cookery Book' under her married name, Louisa Rochfort. Ellen Terry, who was gorgeous, remembered Ruth Herbert thus: ‘She was very tall, with pale gold hair and the spiritual, ethereal look which the aesthetic movement loved. When mother wanted to flatter me very highly, she said that I looked like Miss Herbert’. Henceforth it shall be the highest complement I lavish on people! She may indeed have had her share of unhappiness. The Taunton Courier of 14 June 1899 had this notice, "Miss Ruth Herbert and Somersetshire. 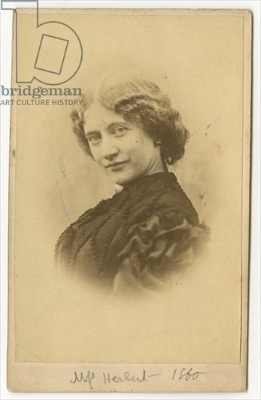 I have seen stated that this lady, leading actress, and for some considerable time manageress of St. James' Theatre, London (born 1834), was the daughter of Somersetshire squire named Maynard. In what part of the county did Mr. Maynard reside?" Now go if you will to the Civil Divorce Records recently posted on Ancestry. There you will find the wife's petition for divorce in Louisa Crabb v. Edward Crabb 1866 (not sure she succeeded). Buried in the pages of legal documents is a copy of the marriage certificate between Louisa Maynard and Edward Crabb. The grounds for annulment were adultery and desertion on the part of the husband. He denied both. So fell a tear for poor Ruth Herbert but please continue your search for a truly happy stunner. They did have a son Arthur Bingham Crabbe born 4 April 1857 and baptized 16 May 1857 at Streatham. He had a long military career; the London Gazette has his retired rank as Captain, but he must be the Major A. 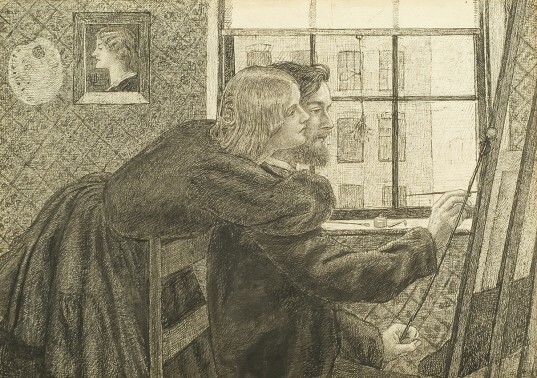 B. Crabbe who sold the Rossetti drawings inherited from his mother. He appears to have married twice as well as losing a suit for breach of promise so no doubt needed the cash. Perhaps he did not get much of the 8414 quid in her estate. Probate was granted to Brigadier General Sir Herbert Conyers Surtees CB MVO DSO MP. As she died a widow one wonders what their relation might have been. Hello! You can contact me through email - stonellwalker@googlemail.com, and I'd be delighted to see the image. As far as I can see that is the same actress - if two actresses shared a surname they tended to put their first initial, for example Miss E. Terry and Miss K. Terry (Ellen and Kate Terry).